The variety to the left is January King a hardy winter variety with heads which are crispy and crunchy and full of flavour. The somewhat unglamorous reputation gained by cabbage has changed over the last few years, newer varieties have been introduced which are milder tasting than the old much stronger flavoured types, these varieties have also been bred to be more disease resistant. Because the cabbage is suitable to most temperate climates and soils and require minimal attention, they are one of the easiest crops to grow. Cabbages will thrive on almost any well drained ground, but prefer a medium to light soil which will maintain a reasonable amount of water. 20-35 weeks for red and autumn cabbages. 28 weeks for winter cabbages. January King Conifer-blue Crispy and crunchy heads with good flavour. Message: Try Thompson and Morgan on line they sell all over the world. 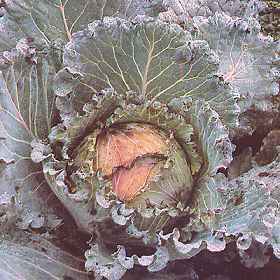 Message: I am from the UK, living in MS USA, and I sadly miss my "spring cabbage" tho open leafed type, planted in late summer and harvested in the early spring.. Can anyone point me to a supplier of seeds to grow this type of cabbage please. Terry. Message: Have the same problem as Paula. What are we doing wrong? Message: given cabbage and cauliflower plants. massive leaves on outside, but hardly any heart as such. can you eat cauliflower leaves? Message: Do I need to cever my winter cabbage to keep them from freezing.